The Anti-Allergen Solution neutralizes allergens in carpets, upholstery, fabrics, on surfaces, and even on your pets, rendering these allergens harmless to allergy sufferers. 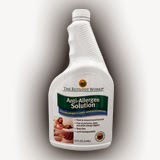 The best hypoallergenic solution to fight indoor allergies without the need to take medicine. This was very happy to try this product because my son is allergic to dogs, cats, dust, trees and grass. I feel so bad for him and I'm always looking for products to help. I sprayed this on my rug, sofa, chairs, mattresses and any where else that seems to attract a lot of dust. Using this product all over my house really seem to help when he comes in from the outside or when I have the windows open. I also bring it to my sisters house because she has a dog. We could never stay to long at my sisters house because of her dog, but using this product seem to really help. It definitely seems to cut down on the allergens. I really love that this a plant base formula and free of perfumes, dyes and other allergy triggers. It's definitely a safer alternative and there's no strong scent.